Manufacturer & Exporter of Vedic Maths Books. Our product range also comprises of Abacus Books, Abacus Study Material and Abacus Bags. 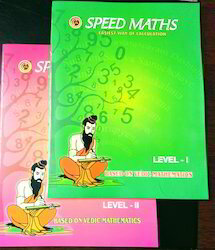 Our competency lies in offering our clients an excellent quality range of Vedic Maths Books. These books are very helpful to those who are willing to take part in competitive examination. We are specialized in various types of abacus and supply our products to many reputed abacus training institutions throughout India as well as across the country. Speedy method to learn mathBased on vedic methodologyHighly attractive in printing. There are 4 books in one set. Four books of 4 levels.